On the history of the domestic dog today the latest theory is that 'domestic dogs' started to separate from wolves between 30,000 - 40,000 years ago. It was thought as human settlements came into being they attracted those wolves who spent their time scavenging for food scraps discarded by humans around the settlements. 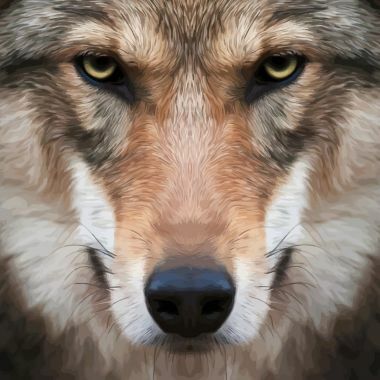 But research is now showing that wolves were involved with humans as long ago as 40,000 BC. In fact the last Ice Age in Britain peaked about 21,000 years ago and human hunters were accompanied by wolves who ate the meaty scraps thrown to them. It is thought the human hunters were resourceful enough to make use of the wolves and this is the time the domestication of the dog might have begun. We do not know for sure but the wolves we know today would have borne little resemblance to those Ice Age wolves discovered as living 30,000-40,000 years ago in Asia. They are now extinct. This is how we think the domestic dog evolved. Then as humans began to farm and grow crops these 'dogs' had a variety of scraps other than raw meat. This is probably why they became classified as omnivore rather than pure carnivore. Yet there is only .02% difference between the DNA of the Grey Wolf living in the wild and your domestic dog today. So why are manufacturers of dried dog food so obssessed with producing something akin to the natural diet of the Wolf in the wild today for your pet? A wolf's diet consists of approximately 50% protein, 45% fat and about 6% carbohydrate. The protein is obviously high because the wolf will consume up to 90% meat from the whole prey. They also consumed smaller amounts of fish and eggs, berries, nuts, grasses and other vegetation. There is no denying the diet of wolves is a healthy diet .... for a wolf. But the lifestyle of a wolf is far removed from your domestic pet. Wolves can travel up to 30 miles a day to hunt for food maintaining an average trotting speed of 5 miles an hour. Their high protein diets are perfect for roaming a territory of around 50 square miles and helping to keep body warmth in the harsh winters. Your average domestic dog may get two walks a day in the park or around a housing estate and live in a centrally heated house. We tend to find in the manufactured version of this diet for domestic dogs the meat content can be as high as 80%, grain free with added fruit, vegetables and herbs. It also comes at a high price compared to many other super premium dry dog foods. Described as the perfect solution to keep your pet in 'optimum health' is rather misleading as exercise has an equal part to play in your dog's health. It certainly does for a wolf! Ancestral diets for dogs contain healthy ingredients and are a far cry away from the cheapest versions containing animal and cereal derivatives almost void of protein and good carbohydrates. But you can still find good quality super premium dry dog food with an adequate meat content and botanicals at a lower price and you can add eggs and other healthy foods into your dog's diet on a weekly basis taking into account the life style of your dog. We all adore the images of the American Timber wolf and there's something quite fascinating about these creatures of the wild. Perhaps we are drawn to their natural existence which is a far cry from the modern world of the 21st Century our pet dogs are immersed in. Whatever it is wolves conjure up the essence of the wild, survival and mystery.......as your pet dog with only .02% difference in dna to the wolf in the wild, snores as he slumbers on the comfort of your settee!